Maybe it would be best to call it quits. However, why should we? Especially after being together for such a long time. Indie rock band The Walkmen experienced a conflict like this first hand a year ago and decided a split would cause a lot of unnecessary hubbub, so an ‘extreme hiatus’ seemed a better plan. A creative gap seemed unavoidable, leaving fans empty handed. Luckily frontman Peter Matthew Bauer didn’t intend to sit still for an indefinite time and started to work on his first solo album. As the title, Liberation!, could suggest a reckoning with the recent past is near. Instead the opposite is true, Bauer’s first is an airy ode to the summerly feeling of freedom that, alright…, isn’t without some conditions. In the past Peter Matthew Bauer proved he’s a gifted multi-instrumentalist. On Liberation! he again shows off his broad and unique musical interests. Throughout the album Hindu chanting, ghanta’s, sitar structured acoustic guitar play, ramshackled lonely piano’s, and so on, are carefully blended with Western pop-rock traditions giving it an rich and accessible sound. On the autobiographical opener ‘I Was Born in an Ashram’, Bauer directly unveils the lyrical outline of the album by singing about the weighty themes such as religious self-realization and the road to true freedom. Remarkably enough the track eventually debouches into a catchy sing-along. Catchiness is key to the musical contents of Liberation! Straight down alternative rock songs such as ‘Fortune Tellers’, ‘Liberation!’ and ‘Irish Wake In Varanasi (For Big Pete Devlin)’ are a no risk addition to almost any playlist but still has an alternative fit to it because of the aforementioned worldly lo-fi production. The later continuous on ‘Shiva the Destroyer’, which is Bauer’s attempt to create a beat to a lazy day, whilst ‘Shaved Heads and Pony Tails’ an unleashed Bauer critically sings about the downsides of religion. Precisely this sort of weightiness is distracting to the feel good melodies. Bauer closes the album with ‘You Are The Chapel’ and concludes that not knowing life’s mysteries should be religion on it own “…you only see what you’re seeing right now, here comes the mystery of it all. I see the mystery, but who do you think you’re fooling. I don’t know…”. 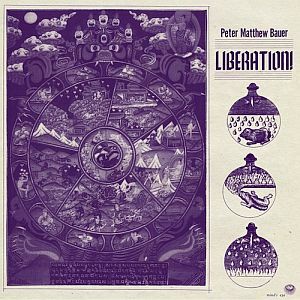 At a first hearing Peter Matthew Bauer first solo effort is an energetic alternative rock record which I believe is able to capture the heart of many. However just below the surface the thematics Bauer addresses are pretty wooly. Catchy music about difficult topics is not for anyone. So those who just want to enjoy the summer and are only looking for a replacement of that endlessly played Vampire Weekend record should keep that in mind. Yet, Liberation! is still a great listen during a blue skied summer’s day. Just remember that best way to enjoy it is to firstly accept that it offers some meaning and perfective to life’s big questions and, secondly happens to sound great as well. This entry was posted in WRM and tagged cd, Liberation!, lo-fi, Mexican Summer, multi-instrumentalist, Music, Peter Matthew Bauer, pop, pop-rock, religion, review, Rock, The Walkmen, Vampire Weekend. Bookmark the permalink.